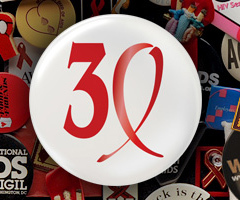 As the thirtieth anniversary of the very beginning of the AIDS crisis draws near, IRMA will be counting down the last five days with a short series on AIDS history. It will explore where we began, where we are now, and where we are going as we continue to battle this disease with hope and determination. This is part two of five. When the eighties came to a close the world was still reeling from the devastation of a new, terrible disease. In the past few years strides had been made to de-stigmatize HIV and its victims, but they were still misunderstood and underrepresented in the media and in the government. This really began to change in the nineties as the government, technology, and pop culture finally took up arms on a large scale. Ryan White died in April of 1990, and four months later the first Ryan White CARE (Comprehensive AIDS Resources Emergency) Act was enacted, marking the largest piece of AIDS-related legislation to date, allocating $220.5 million in federal funds for HIV care and treatment. Since then it has been reauthorized three times. In the next years, congress would pass several more pieces of legislation that would give funds, housing, and (most importantly) legitimacy and support to AIDS victims and advocates. In 1991 the ubiquitous symbol of AIDS support and awareness, the red ribbon, is launched. Right after AIDS became the number one cause of death for males 25-44, the FDA approved a 10-minute HIV test which would change testing for and diagnosis of HIV in the United States. The female condom is approved in 1993. AIDS is the number one cause of death for women 25-44 as well in 1994. Months later AZT is approved to help prevent vertical transmission of the virus. Clinton’s Conference on HIV/AIDS in 1995 comes the year that the number of US HIV cases crosses the 500,000 line. The nineties were not just a decade of political advocacy and technological advances; celebrities began to follow in the footsteps of Elizabeth Taylor and others supporting the fight against AIDS. “Magic” Johnson announced his HIV-positive status in 1991. Rock and roll fans everywhere mourned when icon Freddie Mercury of Queen died from AIDS-related pneumonia. Tom Hanks starred in the film “Philadelphia” as a lawyer with AIDS, bringing his repute and acting talent to the first major Hollywood film about AIDS. Athletes, artists, and other celebrities come forward throughout the decade, each one helping to reduce stigma just a little. Finally, in 1996, the United States collectively heaves a sigh when the number of new diagnoses of AIDS drops for the first time since the start of the epidemic due mostly to the advent of Highly Active Anti-Retrorviral Therapy (HAART.) Really for the first time there are drugs that can suppress the virus. AIDS is no longer the cause for most 25-44 year olds, but remains so for African-Americans. The next year the CDC reports a 47% decline in AIDS deaths from the last year. With such significant improvements, even though AIDS continues to be a vicious disease in the US (especially among minorities), eyes turn to AIDS in the rest of the world as the crisis becomes a global issue. In the new millennium the United States continues to battle HIV at home, but also sends support overseas where victims of the disease in the third world are ravaged by its effects.